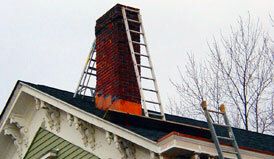 ﻿ New Jersey Chimney, Fireplace & Dryer Vent Cleaning, Service & Repair. Chimney Sweep & Mason Serving NJ since 1989. Before: A deteriorated and poorly pitched crown. After: The repaired structure.